Astro Bugz Revenge is rated 4.8 out of 5 by 4. Rated 5 out of 5 by navajoeyes2 from fast & different Different, fast pace, no real instructions for the upside-down play, who is who? I enjoy a challenge with marble games and this has it. Do not play it when you are tired, you will lose. It is differently a different kind of marble game. The killer bugs are funny. Rated 5 out of 5 by Aniridia from Addicting Outer-Space Fantasy - Innovation at its Highest Peak It seemed primitive, at first... the outer space shots for background, more like something from back in time than like something I could ever get good at, let alone thrill to experience (but it is very beautiful, to be fair). My goodness, was I ever in for an unusual surprise. I can now play it all night long, into the first light, without complaining. The layout of each level is different, demanding differing sets of skills. There are 50 levels of Classic, 50 levels of Revenge (where you play as the invader / from above) and one same level of Versus (in which you play against an opponent, trying to take out each-other's wall while acting goalie for your own, face to face). In Revenge, the alien eggs are differently shaped. In Classic, they occasionally come with the mother. One has to experience this for one's self. Alien "bugz" or eggies, babies, come in various set colours which disappear when you hit them with a same colour ball, a wild ball, or a fire ball. Specific power-ups fall from marked bugz when they are hit (one power-up never falls but causes a bug reaction). These can be caught with your tummy, like snowflakes in an open mouth in Winter. Once they are caught, they speed up your ball, stop the downward or side to side movement of the babies, give wild or fire ball, or shrink your ball size so that you can fit into nooks and crannies, which allows ease of accuracy in some levels and increases the chance of a ball disappearing down an aisle between to columns of bugz in others. Some levels have spinning wheels of bugz. Many levels add the bugza little at a time. 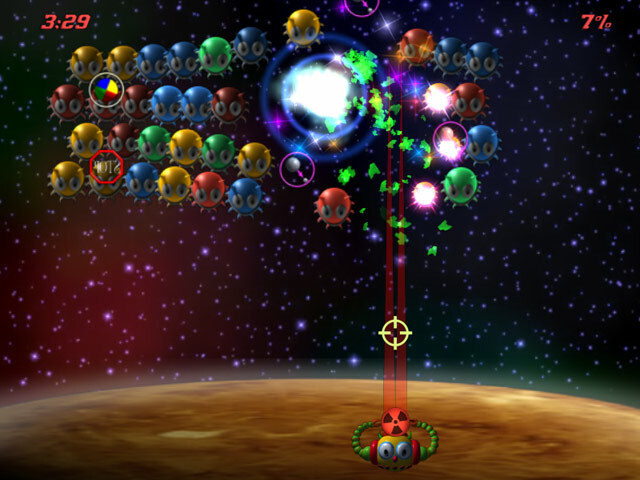 When you kill 5 or more bugz at a time, sparks shower down and, without losing track of the original target ( the nest of bugz) you must also catch as many sparks as possible with the tummy of your plastic toy because these affect the number of further power-ups in the continuing game, and increase your score. 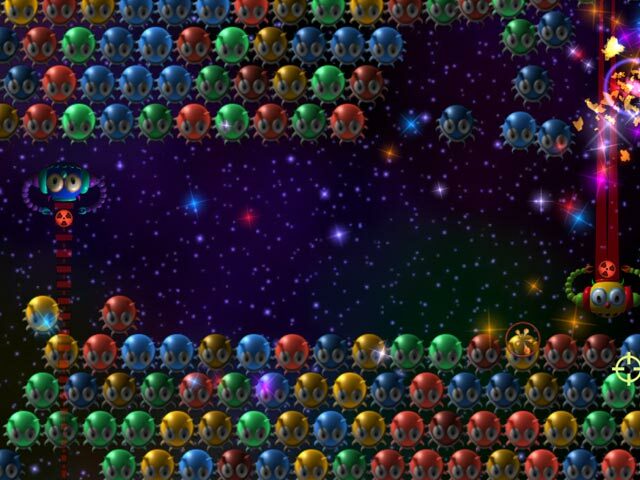 After successful completion of each level there is a quicky where bugz float up across your screen and, by moving your finger around, aiming at each bug without having to click, you cause sparks to rain down and can catch them to add them to your score. 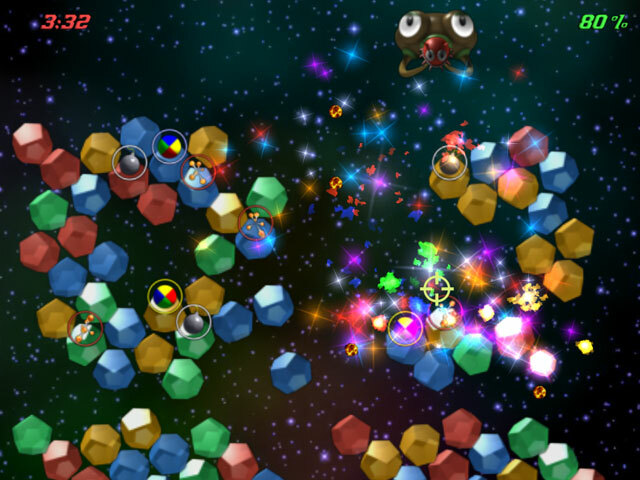 While you are playing the levels, a u f o occasionally glides across the screen and can be hit by any colour for points and stars (sparks). This game is just so much fun, with so many different things to look at, learn, and compete with. I will never get bored with it. It keeps track of four players. Rated 4 out of 5 by old_mare from Blast from the Past! For you boys and girls who played the classic Space Invaders back in the Stone Age, welcome back! Okay, so it isn't it exactly, but very, very close. I don't normally play marble popper games but thought I'd try this one. It's definitely worth a look for those of you who want something eminently playable. I don't know how challenging it gets as it goes on, but my guess is the game will give you a run for your money. The best thing is what the invaders look like when you lose! Protect our solar system from Astro Bugz in this Marble Popper game! 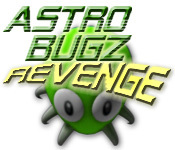 Blow up the bugz and save the day in Astro Bugz Revenge!